What could be sweeter than your own fully customized mix of See’s? Nothing! 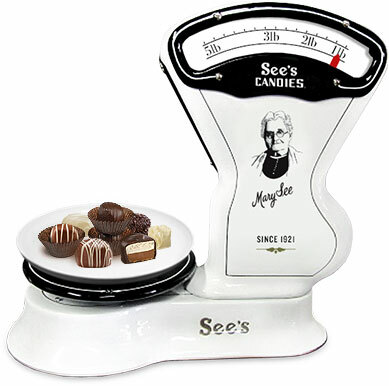 Step up to our virtual candy counter and create your perfect box, or make a custom gift for another chocolate lover. A 1 lb box can hold up to 26 pieces. A 2 lb box can hold up to 52 pieces. A 3 lb box can hold up to 78 pieces. A 5 lb box can hold up to 130 pieces. Click on the pieces to the left to add them to your box or to learn more about them. You may choose up to 10 different candies. A 1 lb box holds about 26 pieces. Click on the “X” to remove a piece from your box. Click on “View Your Candies” to see a list of all of the candies that you have added. Most importantly, have fun creating the yum! Choose a candy to get the sweet details. Add it to your bag below. You get free gift wrap!